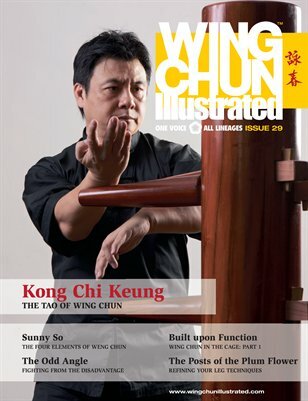 Issue 29 of WCI features Sifu Kong Chi Keung on the cover. Sifu Kong is one of the most popular Wing Chun teachers in Hong Kong. He is renowned for his practical fighting skills and, undoubtedly, for his appearance on Discovery Channel’s Fight Quest. Sifu Kong was 12 years old when he first came into contact with martial arts and, in the 1980s, he became a disciple of 1970’s Southeast Asia Full Contact Fighting Champion and Da Sheng Pi Gua Gung Fu Master, Sin Lam Yuk. In 1991, Sifu Kong became a disciple of Wing Chun Master, Au Chi Sing. In 1996, he studied under Sigung Chau Lin Fat to further refine and gain a deeper knowledge of Wing Chun and to study Qigong. The same year, the Ving Tsun Athletic Association issued the Instructor Certificate to Sifu Kong and, in 1997, he established the Ving Tsun Kong Chi Keung Martial Arts Institute. For a complete table of contents, please visit our website.